Welcome Autumn! I got too busy doing these pillow cases for my living room and never got the chance to post something. Thanks for my first fifteen followers and to those who are not yet a member, I welcome you to my blog. I will be posting more interesting projects that you can also create. And I am hoping that this will be a way for us to be friends. To the Blogs who featured my projects, thank you for appreciating my works. As I have said, I been got too busy with my pillows. I love the chevron and quatrefoil patterns, and bird in branch of a tree. I can see it anywhere in the blog world. I decided to incorporate these to my throw pillows. (I know! I know! You can see it anywhere.) 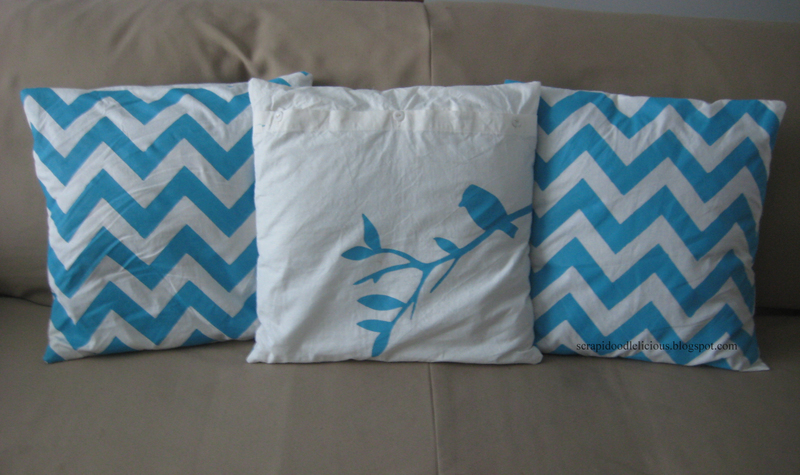 With these pillows of mine, I made the prints from the scratch. (Yes! 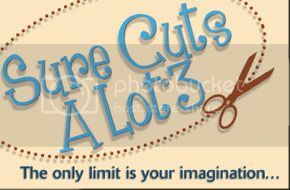 You might say, "You can print nowadays in fabric using painter's tape or stencils".) Here, I only used my excess cardstocks or poster board. I even recycled (I mean upcycle.) 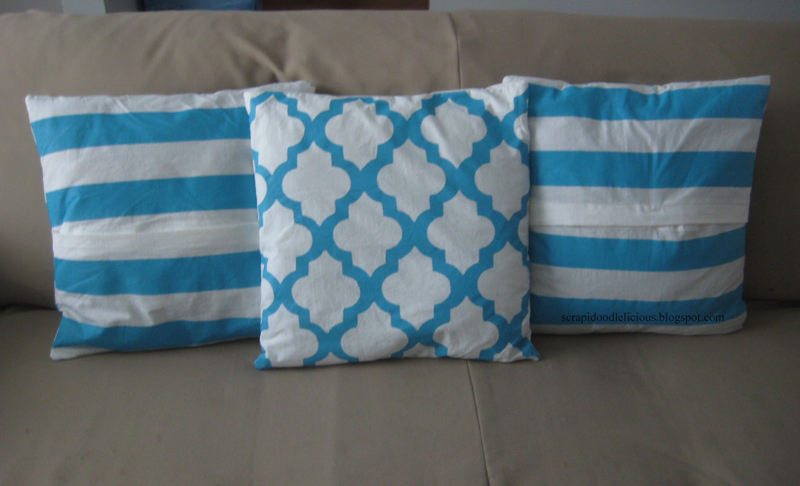 two plain 27 X 27 inches throw pillows covers I bought from Value Village (sorry no photo of the before). See what the outcome. Here's the front view. In these, I used chevron pattern and a bird in the branch of a tree. Here's the same pillow above (but the other side or the back sides). It's not even back because I used stripes and quatrefoil pattern. 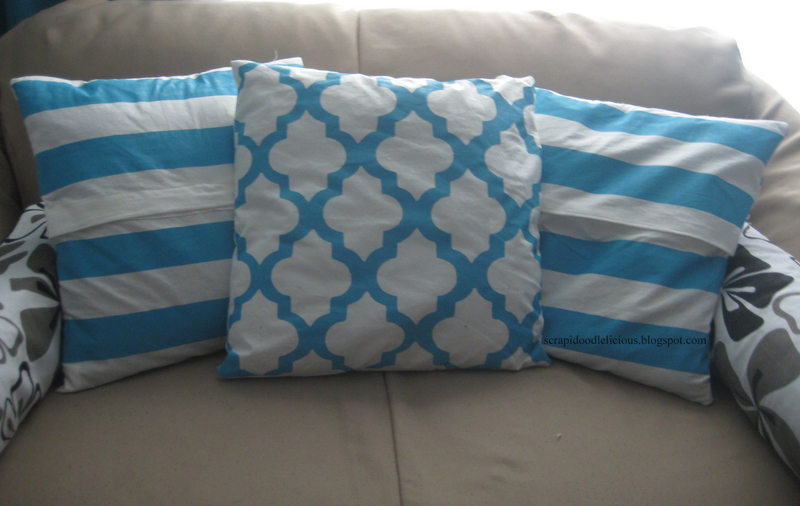 I decided to have different style of pattern in a pillow so I can alternate the designs. 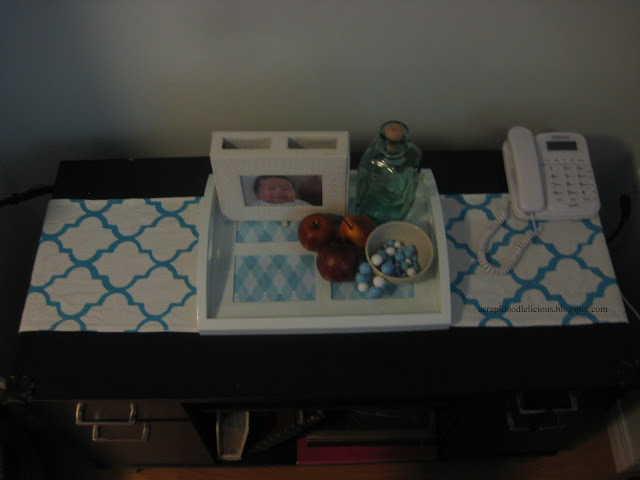 Plus, I got an excess fabric and I made a table runner. Plus (another one), I have an ongoing project for a small rectangular pillow coming from the fabric I bought too. Nothing wasted. I'll show you when it's done. I don't have a fancy or I can say a real sewing machine. I don't even know how to sew. My mom does! I've been asking her to teach me on how-to every time she's visiting us from California but we never got the chance to do so. 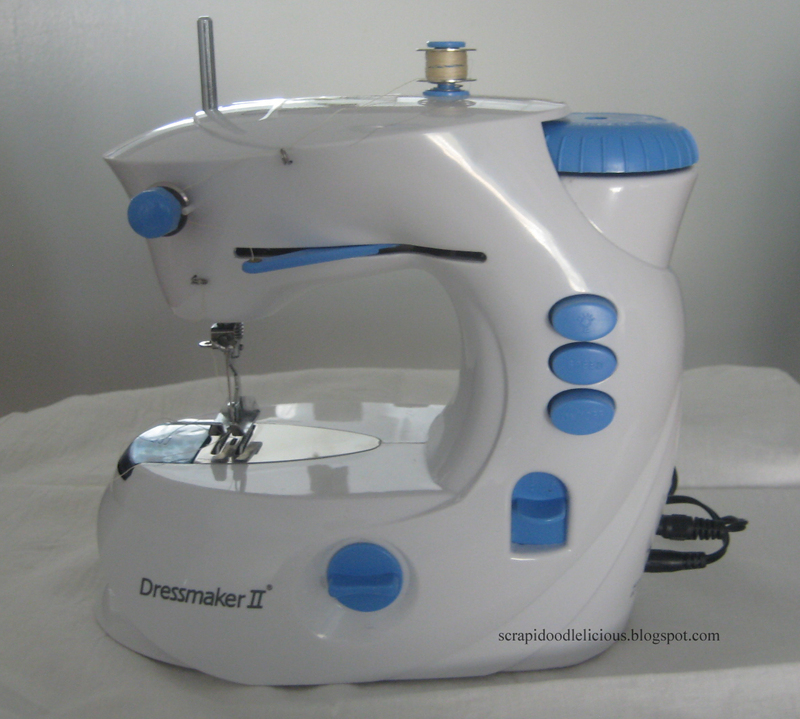 Since I want to save a lot and I really want to have a color and pattern in my living room, I took the chance to sew with this sewing machine. Believe it or not! The tutorial on how to print these patterns is coming soon. Keep viewing. Great pillows and fabrics! What a sweet little sewing machine! Cute cute blog!! I am your newest follower! Thanks for stopping by my blog! Thanks Ashley for following my blog. Those are simply adorable. Love the colors too. Thanks for sharing with my newbie party. Glad to have you and I look forward to your participation. My link goes up every Sunday evening. I usually keep it open til Wed night, however I am changing that til Tuesday night. I want a smaller party and it was getting too big. Hi Ela! I love this fabric and what you did with it. Your pillows are fabulous! Thank you so much for stopping by HomeSavvyAtoZ.com. I am happy to be your newest follower! I have a Freshmen Friday blog party that you may enjoy. It is a great place for new bloggers to get together, learn something new, and shamelessly promote their sites! I hope you will stop by! 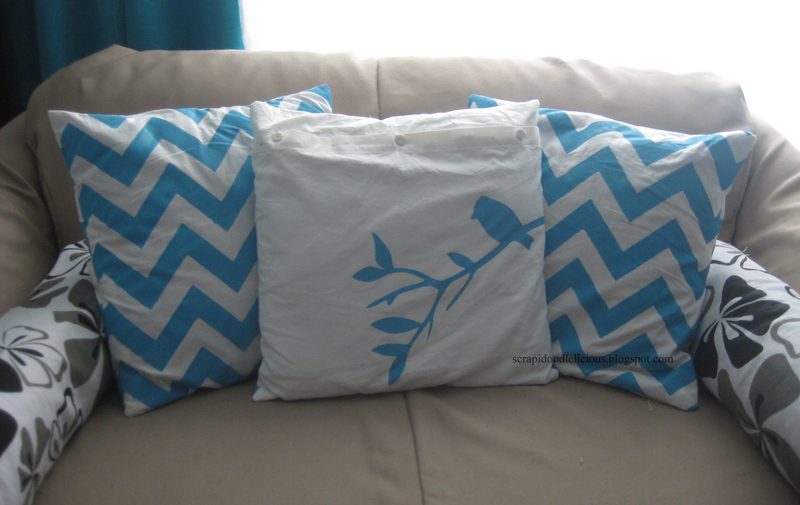 I love this fabric and the pillows! Thanks for linking up to Things I've Done Thursday! Your pillows are so pretty! Love the contrast between the white and aqua! And hey, I have that sewing machine too. ;) Coming over from Transformation Thursday and your newest follower! Those are fantastic and to think you made them with the cutest lil' sewing machine ever! :) Thanx for coming to the party!! Great job on the pillows! Love them! Adorable pillows! Love the colors. 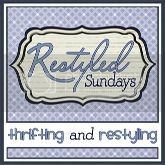 Ela, thanks for joining my Restyled Sundays party. I can't believe what a nice job you did with that sewing machine. I really love the quatrafoil design. I would so appreciate if you add my button to you post. I am your newest follower. Pretty! The patterns and colors are great! I love them! Both the color and the patterns are perfect! I especially love the bird pillow! Love all of the pillows! Thank you so much for linking up! I really love seeing all the talent out there! LOVE the materials you used! These are all really cute! Good job! My 2 favorite patterns! Beautiful! these are so lovely! thanks so much for linking this up to my tip-toe thru tuesday party! hope to see you again this week! Those pillows are beautiful and I love the color! Thank you so much sharing and for linking up to our party Show and Share this week! Come on back this Wednesday to link up your current projects. Your pillows are really cute! They look very chic! How smart to create reversible pillows, Ela! It makes them very versatile.